The Beurer Heated Sofa Cushion offers you year-round therapeutic relief by providing soothing heating relief straight to where you need it most. Simply snuggle in and melt tight muscles to help provide much needed relief after a long day. 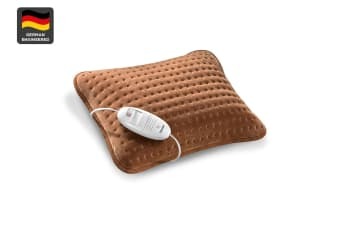 You can also remove the cushion’s insert to easily transform the unit into a versatile heat pad. Also, the TURBO SPEED feature proves extremely beneficial for those times you’re seeking instant relief to sore and tired muscles and joints.